Bluebirds were there to welcome the first settlers of Plymouth Colony, who called them blue robins. 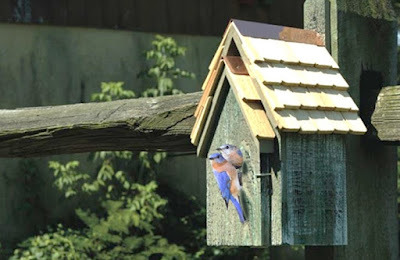 Now you can return the hospitality by putting up a Bluebird Manor. This Heartwood home built from solid cypress features a stone-washed shingled roof, solid copper trim and hinged front door for east access, viewing and cleaning. It has excellent floor drainage and roof ventilation, with mounting paddle for easy hanging. All Heartwood homes are built in a small, friendly town of Star, Mississippi. The company specializes in architecture for the birds using cypress as the wood. In addition to boasting a beautiful grain and coloring, cypress is naturally rot and decay-resistant, as well as naturally regenerating. When a tree is harvested, the stump automatically regenerates a new sapling; saplings also sprout from the root system of a healthy adult tree. While this helps protect cypress from over cutting, Heartwood takes the extra step of purchasing only cypress that has been harvested in accordance with FSC (Forest Stewardship Council) guidelines and use only short pieces of lumber, which would otherwise be chipped and burned. Even the chips and sawdust they produce as waste go into garden mulch, to deteriorate naturally and add nutrients to the soil. Today, global warming and deforestation have put migratory songbirds in dire peril. At Heartwood, they’re committed to creating safe sanctuaries, with their homes and with green manufacturing that helps make the whole world safer and more eco-friendly for the earth’s most precious creatures. What direction should a bird house face? My first response for the placement of a bird house was the same advice I give in the placement of bird feeders; put the houses where you can view them. After years of customer feedback I still give that advice but add that if possible the entrance hole should face east or southeast for the most success. 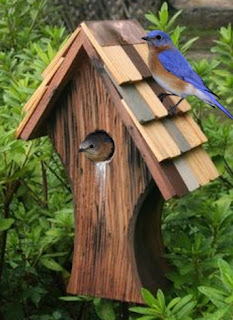 In Mid-Michigan Eastern Bluebirds like to nest in fields, meadows, orchards, farm fields, large lawns, and golf courses. Their houses should be mounted on our Wild Birds Unlimited APS birdhouse pole or a fence post approximately five feet above the ground. If possible, face the house away from prevailing winds and facing towards a tree or shrub and 100 feet from the house. Trees and shrubs provide a perching area for the bluebirds to hunt bugs and a landing spot for the young bluebirds when they first leave the house. Eastern Bluebird houses should be spaced at least 100 to 150 yards apart. I did a little investigating and found a report to back up our customers' theory that birds have a preference in the direction of their house. Cornell Lab of Ornithology has collected research by citizen scientists across the U.S. to reveal that the Eastern Bluebirds will nest in a bird house that faces in any direction. In the northern states like Michigan, however, the birds prefer the early morning sun coming in the front of the house as it faces the east. As spring approaches the goldfinches are preparing to lose their dull feathers and grow their bright yellow feathers. American Goldfinches are the only finches in North America to go through a complete molt two times a year. In the spring the duller olive green wardrobe of the male is switched over to the bright yellow feathers with a stylish black cap and black and white wings. The spring molt requires a large amount of nutrients and energy which probably explains their ravenous behavior at the feeders right now. Are your feeders clean and full of fresh seed? 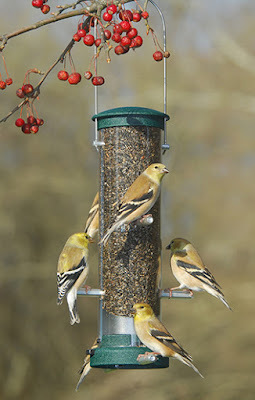 At the feeders they will be looking for food full high fat like Sunflower or Nyjer thistle. Habitat is also important. In this case you do less work, not more. They love to eat dandelion and grass seeds and don't cut off the tops of your Marigold, Zinnias, Cosmos, or Coneflowers... Goldfinches love them! A row of sunflowers along the fence can attract finches as well as a variety of other birds too. And if you don’t have a natural water source nearby, set up a bird bath. Place it among shrubs and low-branched trees so goldfinches can keep watch for predators while descending gradually toward the water. Wild birds can obtain some water from their food, but goldfinches are vegetarians and like to sip from shallow baths where available to wet their whistle. Each year, billions of songbirds set out on late winter evenings to fly to their breeding grounds. New research finds that migrating birds change abruptly from diurnal (daytime) to nocturnal activity immediately before departure. They take to the air on starry nights between dusk and midnight. 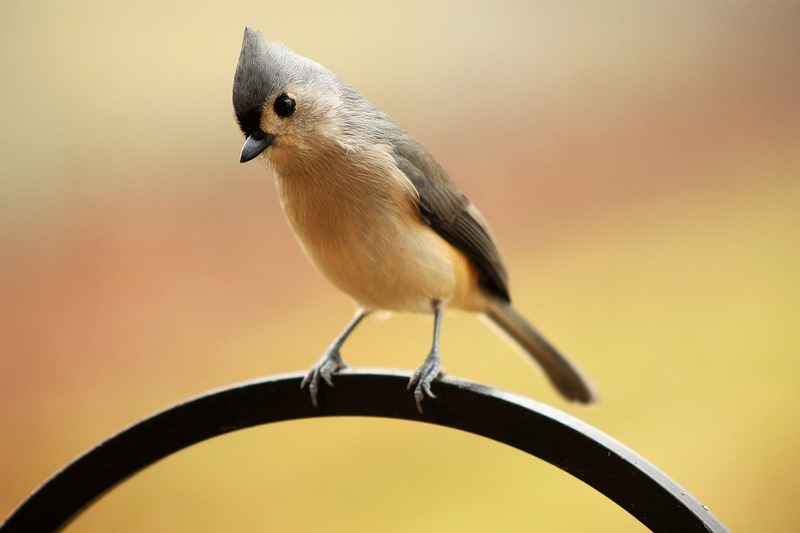 In late winter and early spring, the numbers and variety of birds appearing in your yard can actually change every morning as many small songbirds arrive. Species such as warblers, vireos, orioles, grosbeaks, tanagers, buntings, blackbirds and sparrows all migrate overnight. It is not uncommon for birds to lose one-fourth to one-half of their body weight as they migrate thousands of miles. Make sure your yard is ready for the influx by creating a “stopover site” with plenty of food, water and shelter. of mid-to-late winter, this call carries well through the woods. While courting, mated pairs also perform a riotous duet of cackles, hoots, caws and gurgles. Does the warm weather mean birds will arrive early? Studies have found that spring migration times have advanced over time and as spring has come earlier. Migratory songbirds, use weather and light changes as cues to tell them when it's time to migrate, but with the earth now getting hotter each year, birds can no longer rely on the once predictable climate. Now if the weather is good and there is food to support the journey north, we may see the birds early. Migrating birds follow the blooms and bugs. I’ve already had reports of blackbirds, robins, cranes and other waterfowl arriving. I've had some customers tell me they already have some American Robins calling for mates in their yards. Robins have always been a welcome and reassuring neighbor announcing spring. The American Robin was named by early British colonists after the friendly European Robin they left behind. 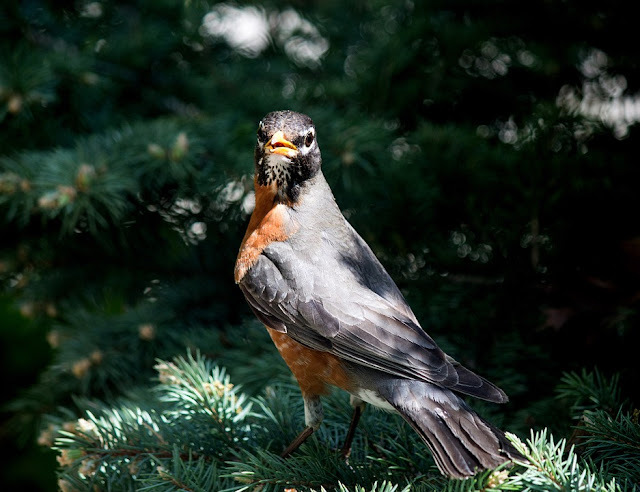 There are a few things you can do to invite robins to nest in your yard. 2. Food - You can feed robins chopped apples, suet, mealworms, or nuts on a tray feeder. I like to put out a Wild Birds Unlimited Cranberry Fare seed block that is full of pecans and fruit when the robins visit. 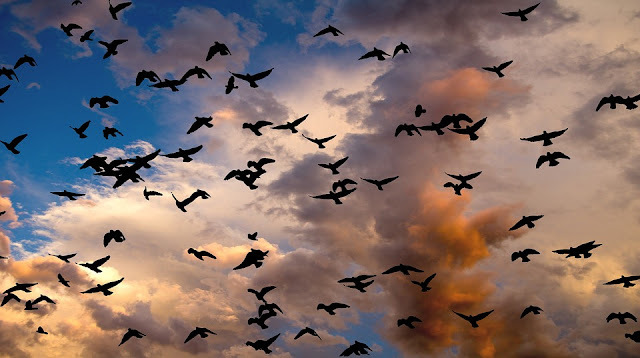 You may have noticed that as the days get longer, the birds begin to sing more. 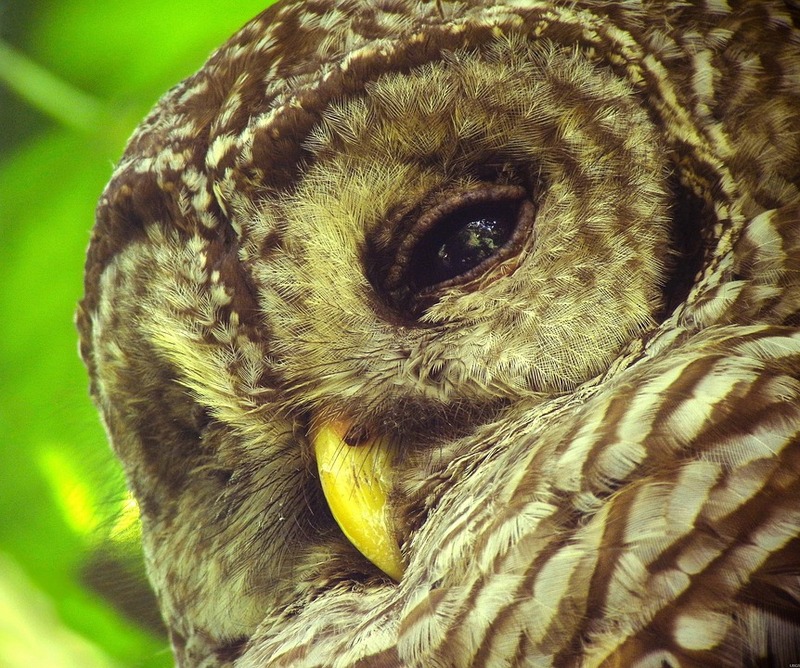 A key part of a bird’s brain is affected by seasonal change. When birds are exposed to longer days, hormones stimulate the pituitary gland indirectly to prepare birds’ bodies for the breeding season and results in increased singing. So keep your feeders full. Food is the most essential element, providing birds with the energy, stamina and nutrition they need. Birds are starting to choose nesting territories and will be looking for food, water, nesting material and nesting boxes. In return, for our support, we receive beautiful bird song and a backyard that is bird family-friendly. 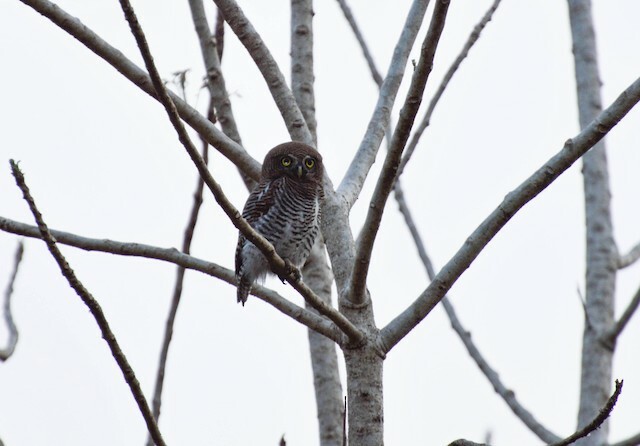 Nearly 5,000 species have been reported so far, including stunners documented with photos such as Blakiston’s Fish-Owl in Japan, and Jungle Owlet in India. Compared to the very cold winters of the past two years, this year’s GBBC has been relatively warm. Some early migrants (e.g., geese, Sandhill Cranes) have been seen on the move. There has also been more open water around, which has increased the diversity of waterfowl in northern areas. Another species dependent on open water, Belted Kingfisher, has been able to stay farther north this winter than it has in the past couple colder winters when more ponds and rivers have frozen. 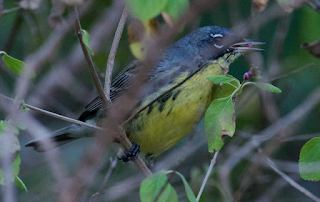 Never-before-seen in the United States during the GBBC is a Kirtland’s Warbler on Key Biscayne, just outside of Miami. One of the rarest warblers in the world, Kirtland’s Warbler breeds almost exclusively in Michigan and winters almost exclusively in the Bahamas. This bird may have moved to Florida instead due to hurricane damage in the Bahamas (or could just be an explorer!). It was nicely photographed for the GBBC. The numbers change fast, so check out the world rankings to see the latest. See the latest numbers for the U.S. and how your state is doing in comparison. If you click on the name of a state, you can see exactly what birds have been reported there. Let’s keep this great Great GREAT Backyard Bird Count going strong! The 20th annual GBBC is taking place worldwide February 17-20, 2017. 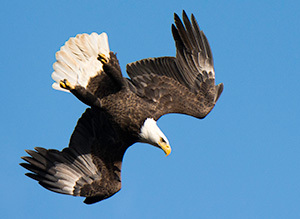 Information gathered and reported online at birdcount.org will help scientists track changes in bird distribution, some of which may be traced unusual weather patterns. Unlike many birds, goldfinches molt their body feathers twice a year. They have bright, attractive yellow feathers in the spring before breeding and much denser olive brown feathers after nesting in the fall. The color of the legs, feet and bill of the American Goldfinch change with each feather molt too. In winter plumage, their legs, feet and bill are dark grayish brown. In breeding plumage they change to a buffy yellow orange color. American Goldfinches are partial migrants, meaning only part of the population migrates annually and if it is a rough winter they can become nomadic. Their winter range includes southern Canada and stretches south through the United States to parts of Mexico. During heavy snowstorms they may move further south to find food only to move back when the weather clears. 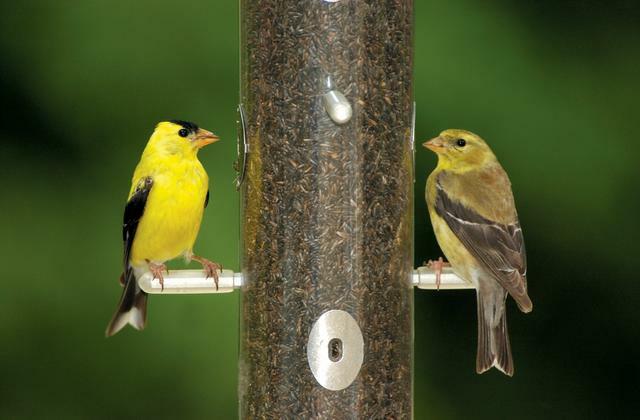 American Goldfinches are common feeder visitors and prefer Nyjer® (thistle) and sunflower seeds. I have dozens of goldfinches right now attacking my window feeder full of No-Mess Blend, a seed blend full of sunflower seeds without the shell. They also appreciate the bird bath. The goldfinches drink frequently and will stay close to reliable sources of water because of their almost exclusive diet of seeds. 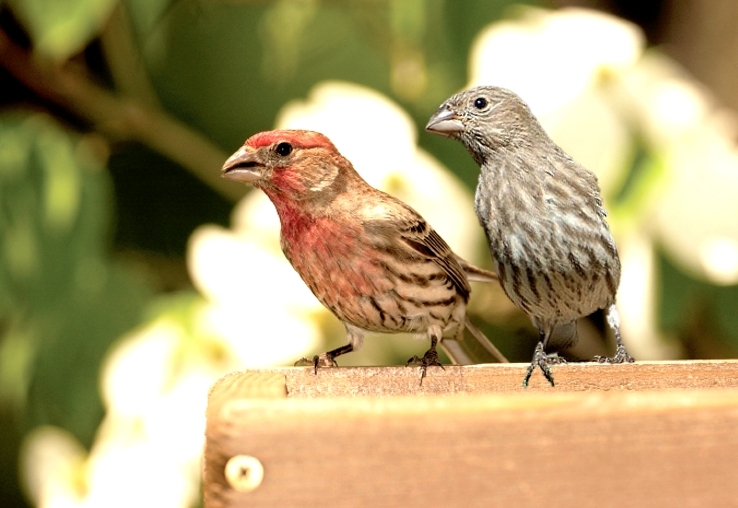 House Finches (Carpodacus mexicanus) are a familiar sight at mid-Michigan bird feeders if you offer sunflower, safflower or Nyjer® (thistle) seed. These talkative little 6 inch birds get their name from their habit of hanging around human houses. 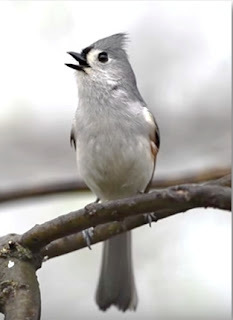 Their cheery warble and variety of chirps are a constant around the feeders and you may find their nests in your hanging baskets, wreaths, or nearby pine trees. They are very good at adapting. The House Finch was not always a local bird. In 1940, they were captured illegally in California and imported to New York by pet dealers. Fearing prosecution, the dealers released their “Hollywood Finches” on Long Island and since then the finches have spread to all corners of the east and have even rejoined their relatives in the west. Adult males are rosy red around the face and upper breast, with streaky brown back, belly and tail. Adult females aren’t red; they are plain grayish-brown with thick, blurry streaks and an indistinctly marked face. 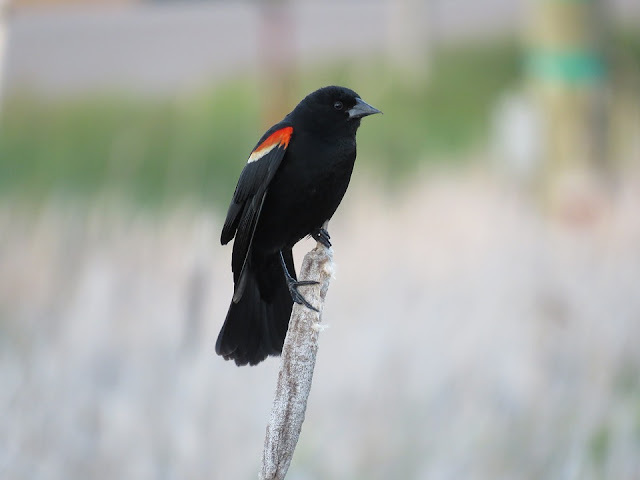 You can help scientist learn more about House Finches and other birds in our area by participating in the Great Backyard Birdcount. Anyone anywhere in the world can count birds for at least 15 minutes on one and enter their sightings at www.BirdCount.org. The information gathered by tens of thousands of volunteers like you helps track the health of bird populations at a scale that would not otherwise be possible. The GBBC is a joint project of the Cornell Lab of Ornithology and the National Audubon Society with Wild Birds Unlimited, as a sponsor! It was so beautiful this morning I couldn't wait to walk to the Wild Birds Unlimited store. I heard a lot of bird songs; Cedar Waxwings over the school, cardinals, chickadees and goldfinches in the trees, and is that a Red-tailed Hawk I hear? Can't fool me! It was a Blue Jay in the tree right next to the sidewalk. I told the jay, "I mean no harm jay, just enjoying the day." 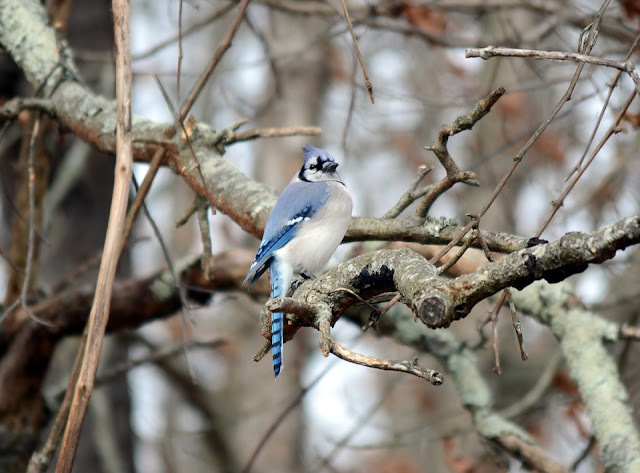 The Blue Jay is a large common songbird at most mid-Michigan bird feeders. With their perky crest, blue, white, and black plumage and a large variety of noisy calls. Like other members of the corvid family, jays are pretty good mimics; they commonly impersonate Red-tailed and Red-shouldered Hawks. But their most common call is a loud jay jay along with other clear whistled notes and gurgling sounds. Sometimes I give a whistle as I fill the feeders to alert a scout bird that their is food available. He reports back to the family with his whistle and soon I have a family of jays visiting, along a whole community of other birds. I fill my many different feeders regularly with the best Wild Birds Unlimited Seed Blends along with nuts, sunflower seeds, and suet. Spring may come early this year and now you get a jump start on a mini garden. For a limited time Wild Birds Unlimited East Lansing has a couple cute items that let you watch some greens grow. 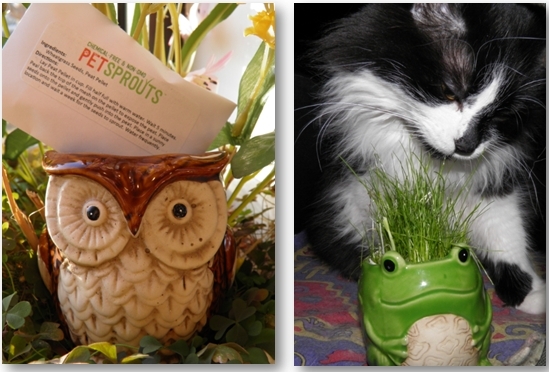 Cat tested and Dolly approved, these cute little planters come with a peat pellet and wheat grass seed. Grass can be an attractive addition to your home, and a welcome treat for your indoor cat, year around. 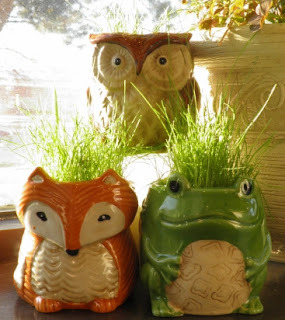 Once the grass is gone you can grow more or use the planter to hold pens or other miniature plants. For those with green thumbs or not so green, just to add water and watch it grow. Choose one or bundle all three together!